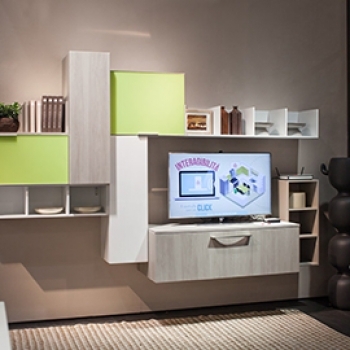 The E-kitchen program is an Industry 2015 initiative aimed at development of a new "kitchen environment" which, besides rethinking ergonomics by establishing the basic rules of good design and innovation in furniture manufacture, also includes several domotics functions representing the "kitchen" of the future, where comfort, efficiency, usability, safety and interaction with the outside world and the new "smart" functions are combined with the stylishness of a “Made in Italy” product (MI). Freer and more functional design based on ergonomic principles to release the kitchen environment from structural restrictions (position of gas/water connections and drains) and offer more independence. Increases the space on the worktop and simultaneously exploits new storage solutions. Monitoring, control and remote access through a single “user friendly” interface of all the "technological" devices present in the kitchen, thus ensuring interaction between machine-environment, human-machine and human-environment. 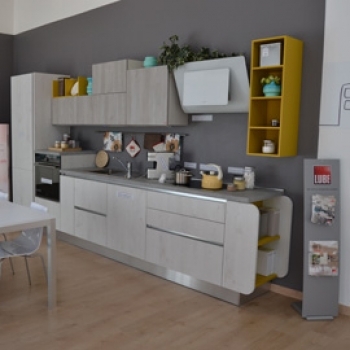 This innovation provides the technological heart of the e-kitchen: domotics. This is aimed at achieving a high level of integration between perception, senses and intelligence, transforming the input signals from the household appliances and technological devices into actions which produce positive effects on the environment and on humans. Monitor functioning and energy consumption of all kitchen devices, including both the latest generation of "smart" household appliances and the traditional ones with no smart technology, such as small household appliances or the gas-fired hob. Receive warning signals from both the environment and the individual devices (e.g. : household appliances). Check all household appliance functions either directly or remotely via a tablet, smartphone or TV. Our partners at Indesit Company, Spese Telecom have ensured that all the machines present in the kitchen can communicate with each other: the e - kitchen system is based on ZigBee wireless technology and, in particular, on the ZigBee Home@Automation 1.2 standard, created by the Energy@home Consortium, of which Indesit Company and Telecom Italia are founding members. A “smart multiple socket” has also been created to simultaneously supply power and connect any device to the e - kitchen system, even ones which do not actually form part of the system itself, such as the kitchen lighting, the environmental sensor network, the water purifying machine, the coffee machine, etc. The “orchestra conductor” connecting the devices is Smart Gateway, a technology developed by Telecom, which is connected to the Internet via a domestic modem. 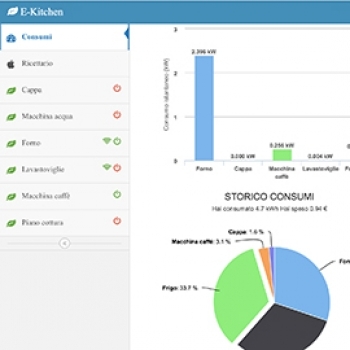 E - kitchen teaches the user how to manage aspects of energy efficiency/consumption in the kitchen. The user can check the status of electricity consumption and manage the overload status and 3.5 kw risk threshold imposed by Enel. To use a practical example, the system can pause the dishwasher if something is being cooked in the oven, to avoid exceeding the threshold, and warn the user of this through the interface. 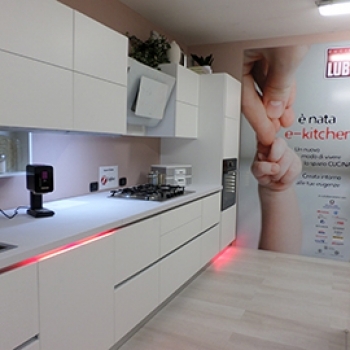 The kitchen lighting system becomes a means of increased feedback: the kitchen itself is the channel of communication and indicates the warning status when the 3.5 kw threshold is exceeded, by switching on red warning lights corresponding with the household appliances in use (e.g. oven and dishwasher) or if there are anomalies on an appliance or the safety threshold of an environmental sensor is exceeded (e.g. a gas leak). More simply, the system switches on the light corresponding with an operating appliance which may not be visible (such as a recessed dishwasher) or increases comfort by switching on the light under the shelf holding the coffee machine when it is turned on. The single and simple interface allows the household appliances to be checked through more extensive and understandable commands, which indicate, for example, recommendations of the instruction manual for washing or cooking programs, and also the meaning of any alarms or anomalies to assist self-diagnosis and intervention of the assistance service. The system basically makes the appliance's own interface superfluous and, in any case, integrates it with what is contained in the instruction manual or with further practical advice. The e - kitchen sensor network includes air quality, thermo-chamber, temperature, pressure and lighting sensors, all inside a normal, recessed electricity box. The interface uses the data provided by the sensors to turn on the hood if the air needs changing or indicates the status of the cooking rings, thanks to the thermo-chambers. E - kitchen can also be equipped with a pico projector, which projects the user interface onto the kitchen worktop, allowing you to consult a recipe book and assisting access to the Internet while cooking, through a user gesture recognition system. 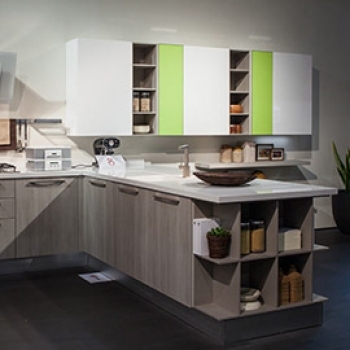 The entire system is perfectly integrated into the kitchen units. E - kitchen is a system of control INSIDE the home, i.e. an HAN (home automation network). This ensures safer management (transmission and reading) of data and protection of privacy. The information never leaves the domestic network. The server is inside the home. E - kitchen is the result of a project funded by the Ministry for Economic Development, which has encouraged - according to a business network logic - cooperation between the household appliance and telecommunications giants. The companies and institutions involved include: Asset, Avents, De' Longhi, Design Innovation, Faber, Indesit Company, Inoxa, MR&D, Renesas, Sabaf, Spes, Telecom and the Cnr - Ifac, Polimi, Unifi, Unipr, Univpm research centres. 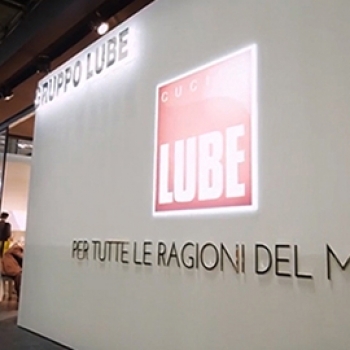 Read the article on "Regione Marche"
Read the article "Lube a Innov-Attori con il progetto E-kitchen"
Read the article on "Lube presente alla manifestazione Innov-Attori"
Leggi la news del progetto "Enel Info+ Smart City L'Aquila"